In Alabama, a developer may need a Permit Agreement for Accommodation of Utility Facilities (Permit) from the Alabama Department of Transportation (ALDOT) to construct a utility facility within, over, or across a state highway right-of-way. 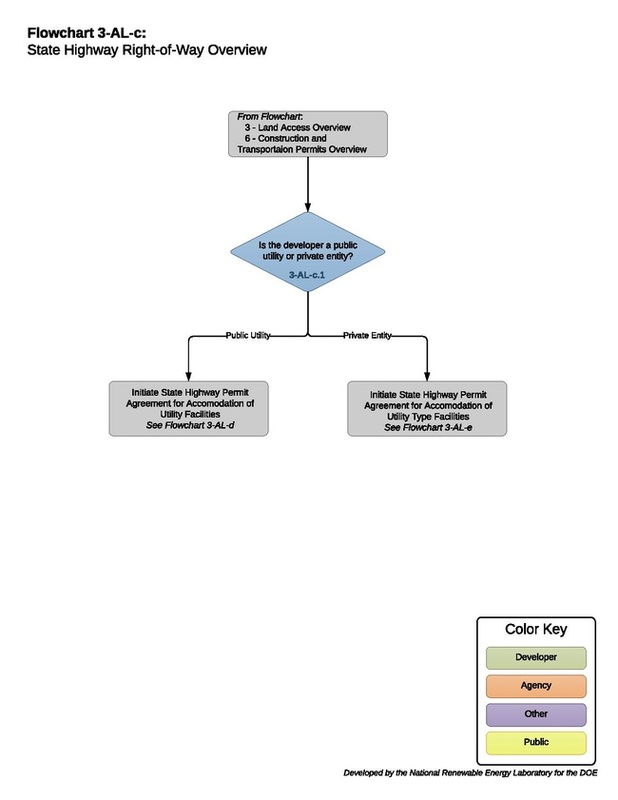 ALDOT Utility Manual, 4.1. In addition, a developer may not dig-up or use a state highway for laying pole lines, without the written consent of the ALDOT. Ala. Code § 23-1-4. ALDOT regulates adding to or upgrading existing a facility, installing a new utility on an existing right-of-way, and changing voltage of an existing utility within, over, or across a state highway right-of-way pursuant to Alabama – Ala. Code §§ 23 et seq., Highways, Roads, Bridges and Ferries and the Alabama Department of Transportation Utility Manual. A developer should contact ALDOT before adding to or upgrading an existing facility, installing a new utility on an existing right-of-way, or changing voltage of an existing utility within, over, or across a state to determine approval requirements. ALDOT Utility Manual, 4.1.2. Aerial service connections, or accessory equipment, or wire substitution, or addition to existing poles, or to support structures crossing any traveled portion of a freeway or highway. Passing through or in conduits already in place where the additional installation does not require the physical disturbance of the surface or sub-surface of the right-of-way, and does not change the type, nature, or operating conditions of the originally approved facility. Other provisions deemed necessary to comply with applicable laws and regulations. In wet or rocky terrain where it will be difficult to maintain minimum bury. Aerial power lines must not cross over bridges where it is possible to avoid such installations. New utility installations must not be located longitudinally within the control-of-access lines for any interstate or other controlled access highway. The ALDOT Maintenance Bureau reviews the Permit Application for technical and administrative completeness. If the ALDOT Maintenance Bureau determines that the Permit Application is complete, the ADLOT Maintenance Bureau forwards a copy of the Permit Application package to the District Office and Division Office. ALDOT Utility Manual, 4.2.4. The ALDOT Maintenance Bureau also retains a copy of the Application and returns two copies to the developer. The ALDOT District Engineer reviews and comments on the Permit Application. The ALDOT District Engineer forwards the comments to the appropriate ALDOT Division Office. ALDOT Utility Manual, 4.2.2. The ALDOT Division Engineer reviews the Permit Application with the ALDOT District Engineer’s comments, and comments on the Permit Application, either approving or denying the Permit Application. ALDOT Utility Manual, 4.2.2. If the ALDOT Division Engineer does not approve the Permit Application, the developer should resolve any deficiencies and resubmit Permit Application materials. If the ALDOT Division Engineer approves the Permit Application, the ALDOT Division Engineer forwards the Permit Application to the Central Office State Maintenance Engineer for comments or approval. ALDOT Utility Manual, 4.2.2. 3-AL-c.13 to 3-AL-c.14 – Does the ADLOT State Maintenance Engineer Approve the Application? If the State Maintenance Engineer approves the Permit Application, then the developer obtains the Permit. ALDOT Utility Manual, 4.2.2. Note: Certain projects may require additional approval from the ALDOT Director. For more information, see: ALDOT Utility Manual, 4.2.2. The project size and complexity. Whether the developer can prove the ability to reimburse ALDOT for any and all damages resulting from the developer’s activities under the permit. Any person aggrieved by a final ALDOT permitting decision may appeal the decision by filing an Application for Rehearing with ALDOT within 15 days of ALDOT issuing its final decision on the Permit Application. Ala. Code § 41-22-17. This page was last modified on 4 September 2018, at 14:58.